In my last post we finished off the First Battle of Deep Bottom by examining the final day of major fighting, July 28, 1864. This day saw intense combat that pitted Confederate infantry under Brig. Gen. James Conner against Union cavalry under Brig. Gen. David McM. Gregg at the Darby Farm. During that fight, two individuals stood out for heroism above and beyond the call of duty – Federal cavalry trooper Timothy O’Connor and Confederate sergeant Adam Ballenger. As we have seen, the fighting at the Darby Farm kicked off when men led by Gen. James Conner from Lane’s Brigade (under Col. Robert V. Cowan), McGowan’s Brigade (under Lt. Col. J.F. Hunt) and Kershaw’s Brigade (under Col. John W. Henagan) left their earthworks at Fussell’s Mill at 10:00 a.m. on the morning of July 28, 1864. Their mission was to turn Hancock’s right and push him back to Curle’s Neck on the James River, where he could be defeated in detail. Unfortunately for the Rebels, there was no reconnaissance conducted to scout the Federal positions. Thus, Conner’s men set forth unaware of a mounted threat moving their way in the form of Union cavalry troopers under Brig. Gen. David Gregg and the always inept Brig. Gen. August V. Kautz. When Conner’s battle line hit a prominent thumb of trees, it split in half with the 1st and 14th South Carolina of Hunt’s Brigade going with Cowan to the right and the remainder of the brigade splitting off to the left with Henagan. With Conner’s battle group sliced in half by the thumb of trees, two separate fights quickly developed, which I call the fights for the lower and upper field. In the lower field, the attacking Confederates were met with stubborn resistance from Federal cavalry which had the decided advantage of repeating carbines. After stalling in the face of superior firepower, the attacking Confederates soon began to give way. The 18th North Carolina had just begun to retreat when the Regular Brigade of the U.S. Cavalry counterattacked. Lt. Col. John McGill, commanding the 18th, reported that “my Regiment had to fall back under a most galling fire, and I fear that several of my men who are now missing were either wounded or killed as several were to start to fall back and have not been seen since.” Among those he feared missing was Cpl. 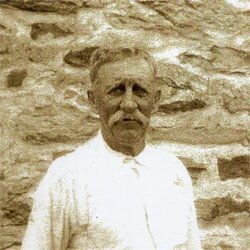 David M. Barefoot of Company H, who “received the colors and bore them at the front until I ordered the Regiment to retreat.” As it turned out, Barefoot had the worst of an encounter with a young trooper in the 1st U.S. Cavalry named Timothy O’Connor. O’Connor’s memorial headstone in Arlington National Cemetery. 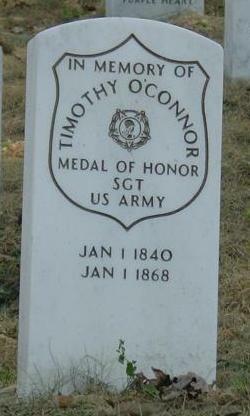 O’Connor was discharged from the army in December of 1865 and returned to Chicago. He died on March 26, 1915, at the age of 72. There is a memorial headstone at Arlington National Cemetery with an incorrect death date, but research indicates that his remains are in Mount Olivet Cemetery in Chicago – which also happens to be the final resting place of Al Capone. However, I was recently contacted by a distant family member who says O’Connor went back to County Kerry after the war and his mortal remains are in an unmarked grave in the land of his birth. This family member further stated that they are attempting to relocate his Medal of Honor. While O’Connor and his compatriots were getting the best of the situation in the Lower Field, his compatriots in the other sector of the battlefield were not so lucky initially. The sheer force of the Confederate attack here caused several regiments of horse soldiers to fall back to better ground. This withdrawal left several 3-inch Ordnance Rifles of Lt. William Dennison’s horse artillery vulnerable. For 22 year old Sgt. Adam W. Ballenger of Company C, 13th South Carolina the alluring site of an exposed enemy gun was too much. The impetuous youngster ran out ahead of the column to take on Dennison’s battery almost singlehandedly. Ballenger ran up to one cannon that had had several horses killed and jumped on it, causing the driver to run off. Incredibly, Ballenger then “jumped off the piece, cut loose the traces and unfastened the off-horse, which he mounted.” He enlisted help in hauling off the piece, encouraging several men to grab the prolonge and begin leading the prize back to the rear. Col. Hunt saw all of his transpire and credited the short-lived Confederate success to Ballenger, stating, “I consider our success due in a great measure to the conduct of Sergt. Ballenger.” After the battle, Gen. McGowan summoned Ballenger to his headquarters and promoted him from sergeant to 2nd Lt. on the spot. Ballenger returned to South Carolina after the war and lived until December of 1912. He is buried at Inman Baptist Church Cemetery in Spartanburg County, South Carolina. The exploits of these two young heroes reveal that there is still much to be gleaned from examining the clashes north of the James River in 1864. This entry was posted in Armies, Battlefields & Historic Places, Battles, Campaigns, Cavalry, Civil War Events, Common Soldier, Leadership--Confederate, Leadership--Federal, Personalities and tagged 13th South Carolina, 14th South Carolina, 18th North Carolina, 1st South Carolina, 1st U.S. Cavalry, 23rd Illinois, Adam Ballenger, Al Capone, Arlington National Cemetery, August Kautz, Confederate Medal of Honor, Curle's Neck, David M. Gregg, First Deep Bottom, J.F. Hunt, James Conner, James Lane, John Henagan, Joseph Kershaw, Medal of Honor, Robert Cowan, Samuel McGowan, Timothy O'Connor. Bookmark the permalink. Fascinating stories, Jimmy Price. Please keep them coming. Adam Washington Ballenger. My husband’s 2nd great-uncle. Thank you for sharing this.